Beautiful 1 Bedroom apartment. 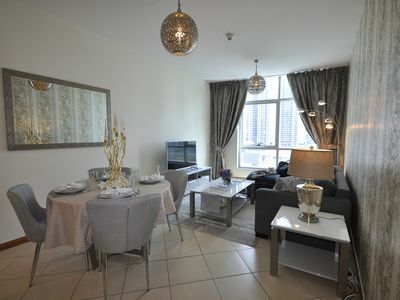 Open plan living dining area with L-shape leather sofa, coffee table, side table, TV unit with LCD TV and DVD player. There is a small balcony from living room. Kitchen is open plan to living hall &amp; is fully equipped with all cutlery and crockery, washing machine, cooker, fridge and freezer, microwave, kettle, toaster, coffee machine. Price is inclusive of water electricity, wireless internet TV channels connection, 1 x week cleaning with bed linen change, 1 allocated covered car park space, access to shared pool and gym. No Smoking. Dubai Gov Tourism Fee (DTCM) is charged $2.75 per night up to max of 30 night stay.